Creamy Garlic Shrimp With Parmesan is a deliciously easy Shrimp Recipe! Coated in a rustic and buttery sauce ready in less than 10 minutes! 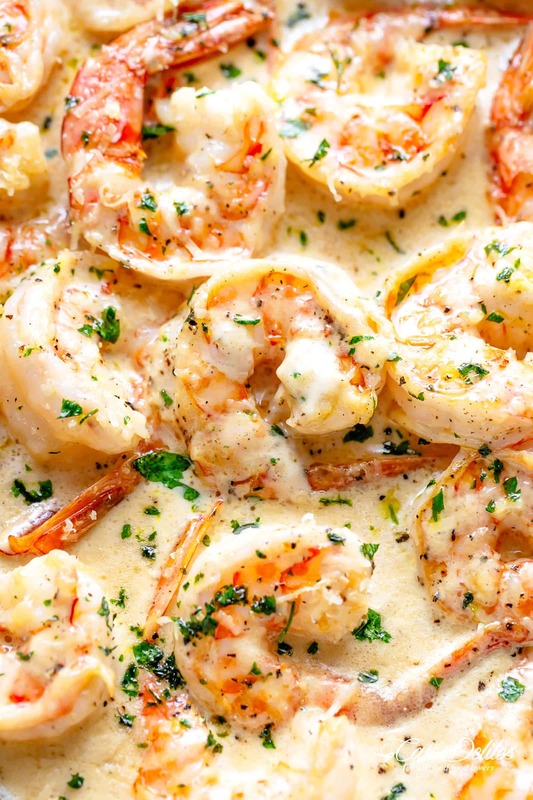 Everyone goes crazy for this simple yet incredible Creamy Garlic Shrimp. 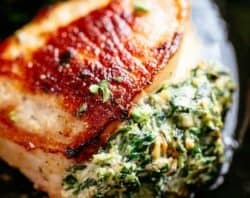 Transform ingredients you most likely already have in your refrigerator into an incredible dinner and serve it with low carb OR carb loaded sides for an amazing meal! All tips and suggestions included. After publishing this Surf & Turf recipe yesterday, you guys have been requesting we post this shrimp recipe separately for easier printing and storing. Well, here it is! 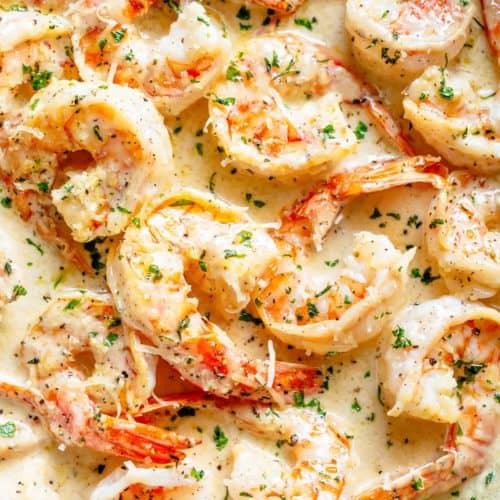 Adapted from our popular Creamy Garlic Scallops recipe, this mouthwatering creamy shrimp goes with absolutely anything. We prefer ours served over rice that has been simmered with onions and garlic for added flavour. Mm-mm-mm. Pasta that has been mixed through with olive oil, salt and garlic. Plus a touch of extra parmesan never hurt anyone. Garlic bread soaking up the creamy sauce. Heaven. You can use shrimp with tails on or off. We kept ours on for a visual impact as they photograph better. Feel free to use reduced fat cream (or light cream), half and half or heavy/thickened cream. You can also use evaporated milk as a low calorie substitution. 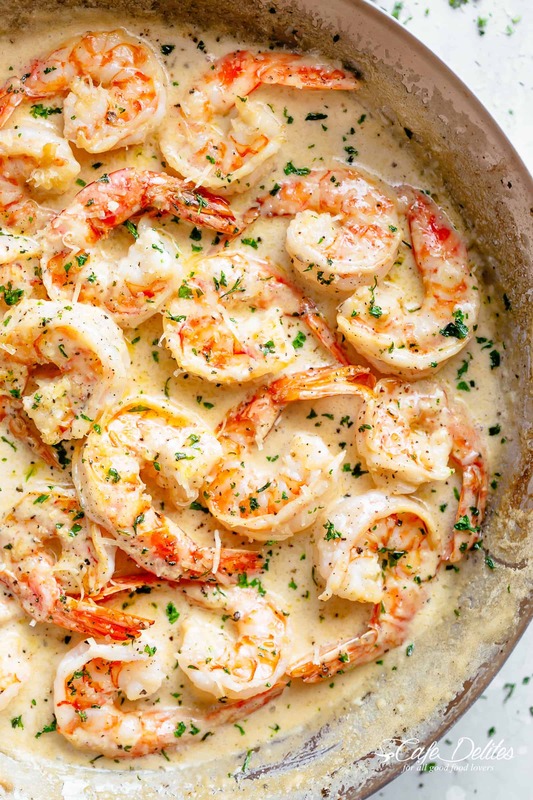 LOVE this Creamy Garlic Shrimp recipe? Try these! The BEST Shrimp now on video! Creamy Garlic Shrimp With Parmesan is a deliciously easy Shrimp Recipe! Coated in a rustic and buttery sauce ready in less than 10 minutes, people will think there is a hidden chef in your kitchen! Transform ingredients you most likely already have in your refrigerator into an incredible dinner! Heat oil a large skillet over medium-high heat. Season shrimp with salt and pepper and fry for 1-2 minutes on each side, until just cooked through and pink. Transfer to a bowl; set aside. Melt the butter in the same skillet. Sauté garlic until fragrant (about 30 seconds). Pour in the white wine or broth; allow to reduce to half while scraping any bits off of the bottom of the pan. Reduce heat to low-medium heat, add the cream and bring to a gentle simmer, while stirring occasionally. Season with salt and pepper to your taste. Add the parmesan cheese and allow sauce to gently simmer for a further minute or so until the cheese melts and sauce thickens. Add the shrimp back into the pan, sprinkle with parsley. Taste test sauce and adjust salt and pepper, if needed. *Use a good quality dry white wine such as a pinot griot or chardonnay. White wine can also be substituted for chicken broth or left out completely. The flavour in the sauce will be altered. 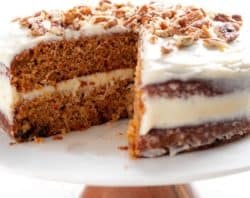 **I use reduced fat cream (or light cream) for this recipe. Substitute with half and half if you wish, being careful not to bring the sauce to a boil or it may curdle. You can also use evaporated milk as a low calorie substitution. Heavy or thickened cream may also be used and will not require thickening with cornstarch. Allow cream to reduce in a gentle simmer until thickened to your liking. Thank you so much! So happy to hear that! Thank you so much. I am very happy you love it! I’m doubling this recipe. Should I double the cream as well? Just seems like a lot of cream. This was awesome! Hard to find food that my man likes and he loved it! We served ours over quinoa and it was amazing! This is amazing !!! I used whipping cream. Followed the exact recipe without any modifications. So delicious ! Made this last night for my husband’s birthday dinner. Amazing! He wants it again tonight…lol. It’s easy enough and restaurant quality. Served it with capellini pasta. I have leftovers for lunch today, can’t wait. 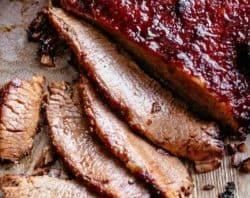 Thank you for this recipe, it’s a keeper! Loved the creamy garlic shrimp! Would skim milk work instead? Couldn’t find low fat cream. Skim milk can work, however you have to be really careful not to boil too hard or fast because it can seperate and curdle. Does this dish freeze okay? Hi Charlotte. Yes it does, but I do recommend having it fresh. Loved this! So easy and so delish! I spooned it over carbquik biscuits and it was amazing! Yes! Enjoy it twice ;)! Recipe was AMAZING! I am so stuffed! I used evaporated milk instead of cream, broth instead of wine and I also add about a tbs of Goya Sazonador Seasoning (green top) to the cream mixture. Spooned over thin spaghetti…uggghhh! I’m so in love! My cousin is so happy she stopped by to catch this meal! Lol. Cafe Delites you’re my Shero! This tasted so amazing! My husband loved it. 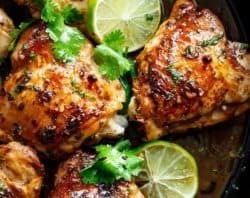 Thank you for an EASY and delicious recipe! Made it. Very nice. I used heavy cream and frozen shrimp. Didn’t let the sauce thicken too much. Will definitely make again. This is delicious!!!! Sautéed sliced zucchini to serve with this. My husband loved the white sauce and zucchini combination. Oh and the shrimp was better after he dunked it in some cocktail sauce. (Really it was!). We will have this again! My family loved it! I served it over the noodles with garlic and olive oil. They gobbled it up. I followed the recipe exactly with heavy cream, only adding a little more than a pound of shrimp. Can you please suggest a reduced fat cream? I’ve looked in refrigerated section near heavy whipping cream and near coffee creamers and near evaporated milk and can’t find anything called this. I can’t wait to try this. Thank you! The recipe isn’t valid anymore. Can you re post it? I saved it to cook tonight after picking up the ingredients and it isn’t showing anymore! Thank you for letting me know! I am so sorry that the recipe went missing! My site had a malfunction for a period of time today and we are just getting things up and running. I apologize for the problem and how long it took. Thank you for your patience and following along with me! If you have any other questions or concerns please email me and I would love to help in any way that I can. 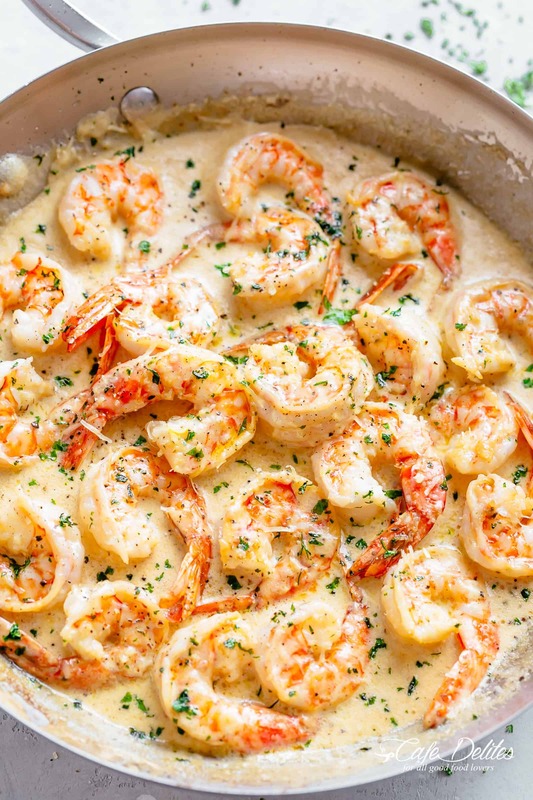 XOXO Here is the Creamy Garlic Shrimp with Parmesan: https://cafedelites.com/creamy-garlic-shrimp/. Thanks for this yummie recipe, it’s really great! I’ve added some double cream instead of half half and a little bit of chili flakes. Left a link on my Twitter and of course on Pinterest! Won’t be the last time I will serve this delicious meal! Do you have a recipe for making that yummy sounding rice that is your preferred way of eating this? 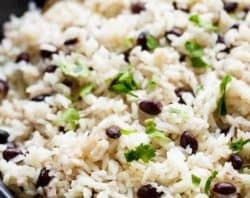 I just take some rice and add in onions and garlic for added flavor. It is simple and delicious! Hope that you enjoy it! What color rice is your favorite to have this with? 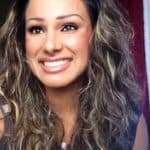 I’m so happy that I just found your page. 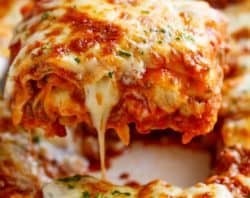 I will 100 cook with a bunch of your recipes I have found. I love that I can read carefully into detail and you include a video. Exactly what I need. Thank you!!!! !